Gastronomic excellence comes one step closer as we launch with the stunning new collection of streamlined Leisure Cuisinemaster range cookers. With intuitive design and a variety of additional, desirable features, these models are sure to help you impress dinner guests with your culinary prowess. The Cuisinemaster range cookers have integrated contemporary style and professional elements including a five zone ceramic hob and warming zone. This model has a brand new slow cooking function, maximising cooking flexibility and allowing you to produce sumptuous casseroles or tasty curries, that are guaranteed to elicit no end of compliments from dinner guests. The Cuisinemaster hob has been carefully designed with a streamlined top to eliminate areas for dirt to accumulate, as well as catalytic liners with removable inner glass doors, to ensure you spend more time cooking and less time scrubbing. Available in black or stainless steel, the Leisure Cuisinemaster will help you deliver even the most exceptional menus at home. Whether hosting a dinner party or breakfast for two, through our new product family, Leisure is championing flexible cooking, capacity and stylish design with the launch of the Leisure Cuisinemaster. Click here to buy the 100 Stainless Steel Leisure Cuisinemaster at Currys. 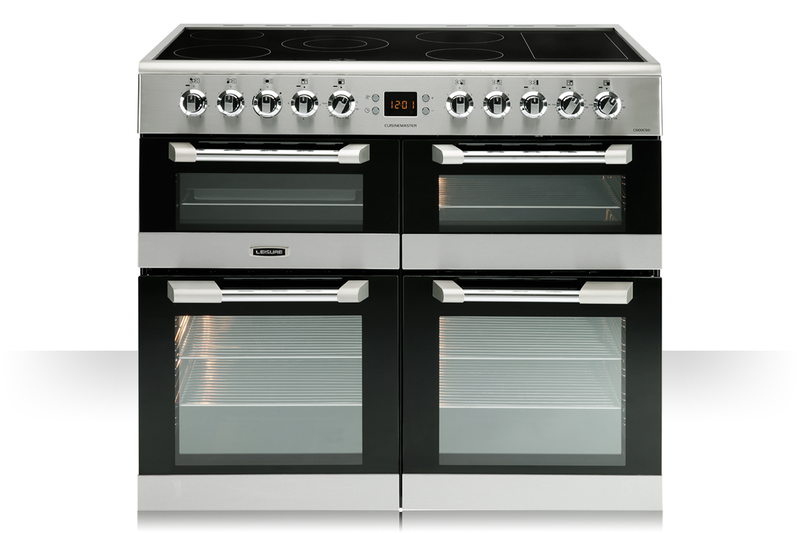 Click here to read about the new 110 Black Leisure Cookmaster at Currys.